House Speaker Paul Ryan told Republicans at a closed-door conference on Thursday that he and other leaders would draft legislation over the weekend that overhauls the nation's healthcare system. Lawmakers hope House committees will vote next week on a bill to repeal and replace the Affordable Care Act in order to push the legislation through both chambers of Congress before the recess in April. But a spokesman for the House Energy and Commerce Committee said there is no vote yet scheduled despite a Republican member of the committee, Chris Collins of New York telling reporters on Thursday that he believed a markup would happen next week. Collins said he expects the bill to rollback Medicaid expansion, but with a three-year delay. Beyond that he and others are unclear as to what the bill may entail. That was just one example of confusion and apparent miscommunication Thursday when Republican and Democratic lawmakers staged a scavenger hunt on Capitol Hill looking for a draft of the bill. 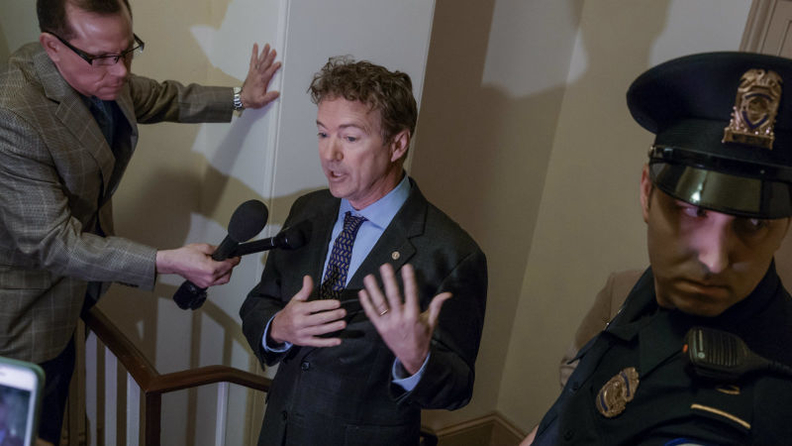 "It's the secret office for the secret bill," Sen. Rand Paul (R-Ky.) said to reporters after being denied entry to a room where he said the measure was being shown to some lawmakers. Paul joins other conservative Republicans in criticizing recent proposals that retain too much of the ACA. Ryan's bill reportedly was being shown privately to GOP lawmakers without distributing copies to avoid leaks, something that's been a problem for the Trump administration. Lawmakers often avoid sharing too many details of draft bills as they make final deals to gain support for their legislation. A sticking point in the case of Ryan's repeal bill is a new tax on expensive employer-provided health plans. Tax hikes are unpopular among Republicans, especially those up for re-election in a few years. President Donald Trump this week urged Republicans to act quickly to repeal the ACA, even though the number of voters opposed to repeal is growing.